I can't tell you the month or day, but I can tell you the time. It was open library period before school officially began for the day. The library was swamped. One checkout after another. Kids coming to me asking about particular books, many bypassing the catalog. Five minutes before the bell was to ring the line of students waiting to checkout snaked across the room and through the bookshelves. I was in panic mode when a student required me to leave the desk to help him, because I was required to get all these kids in class before the bell rang. I stepped away from the desk to help the child at the OPAC. Behind me I heard one of my 5th graders, Garrett, step up to the circulation computer and say, "I'll help whoever is next." I turned and looked at him. He was totally engaged and asking the right questions of the student he was helping. I finished my work with my student, directed him to the proper area, and logged his workstation into management mode. I turned to the line of students at Garrett's desk and said, "I'll help who is next." Between Garrett and me, the last students checking out were only about five minutes late for class. 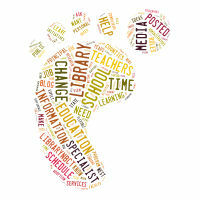 Schedules run schools, and school libraries certainly are subject to the mayhem and order that schedules can create. Fortunately, with Garrett's help, I was able to focus on what a student needed - in my presence, at that time - with very little disruption of the school schedule. I don't know if my stopping the assembly line of checkout to help a child made a difference in that child's life, but I do know it made a difference in mine. I was able to concentrate on the people business which is essential to the success of any library program. I was able to build on a relationship with a student that needed help. I will bet my last dollar that child probably asked me for help again. As Hilda Weisburg noted, with solid relationships in place, students, parents and administrators are likely to continue coming to you when they have a need. For the most part, building relationships comes natural to me. There have been times when I have had to work especially hard on a relationship. Sometimes that happened because the customer and I didn't click. Sometimes it was because of precedents set by former librarians. On one of my very first days in the position I have held for almost twenty years, a kindergarten teacher paraded her children through the library and announced, "This is the library. We aren't allowed in here." I was speechless. And I vowed to make her my friend. By the time she retired we weren't going to the movies together, but we did develop a mutual respect. I believe one needs to be a people person to be in the information industry, no matter what its form. I have had way too many people tell me enviously that my job is so nice and quiet to believe that everyone who goes into this profession is in it to help people. How can one help a person, deliver a service that requires specific knowledge of that person's needs, if one is unwilling to talk to him or bend a little bit to provide good public service? These are the things that are remembered: someone knows your name and greets you anytime he sees you, and that someone did something a little extra to make you feel special. Something little is all it takes to touch someone, to begin a trusted relationship. My stepping away from a backed up line to help a child find what he wanted should have told that child "You matter." What Garrett did for me when he stepped up to the circulation desk PC and began checking out all those kids was a little thing that helped make an already decent relationship with him that much better. His stepping up allowed me to make my relationship with the student needing help even stronger. It told all those waiting in line that they mattered, too. What I did for him in letting him get away with running the circ desk without explicit permission was a nonverbal statement of trust and gratitude. On that very hectic morning, everybody but the timekeepers won.